When it comes to marketing and driving traffic to your advisor website, video 📹 is here to stay. 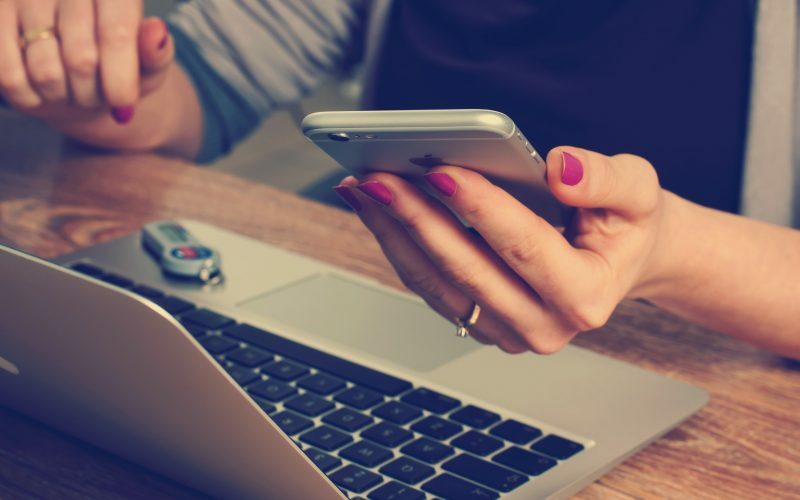 Not only is that an important part of your website, but as we have posted in many other blogs, social media is also a driving force when it comes to bringing in new prospects. So, what do you get when you combine both LinkedIn and video? We have got some key tips on everything you need to know about video on LinkedIn this year! So, how do you go about integrating video into your digital marketing strategy? Check out the surefire tips below to start boosting your conversions today. First, it’s important to understand that there’s not just one type of video, there are different types and different ways to go about sharing those video onto your LinkedIn profile and company pages. Many brands still choose to upload their videos to a platform such as YouTube or Vimeo and then share the link on LinkedIn. This is simple and it does work, but for many reasons, we’re finding that posting your videos natively to LinkedIn tend to be more effective when it comes to engagement. Ok so you’re supposed to be sharing videos natively but what exactly is “native video,” you ask? It is a video that is uploaded directly to LinkedIn or created on the actual platform. So there is no link sharing from YouTube or another platform in your post. 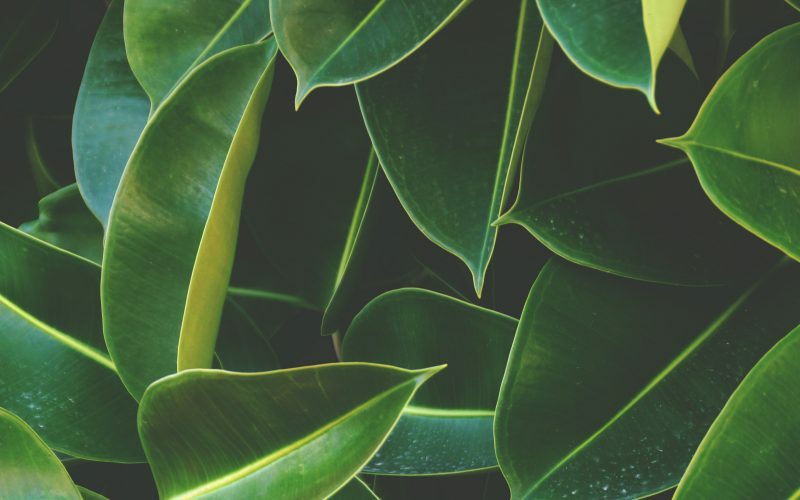 With native videos, LinkedIn allows you to share videos that are up to 10 minutes long, so that’s a great opportunity to include a lot of information to your connections. It’s so simple, and when videos are shared natively, it will be shared THOUSANDS of more times than simply uploading a link. All that you have to do it is to record the video and upload the raw video (usually an MP4 file) to each platform individually. All social media platforms have started to prioritize video content, which results in the drastic increase in shares. Unlike videos that have been embedded, LinkedIn native video plays automatically in your feed, which is much more likely to grab the viewers’ attention. It’s such a great way to garner more attention. Video ads on LinkedIn are sponsored company videos that show up in the LinkedIn feed. If you have budget set aside for advertising, video ad campaigns have greater potential to ↗ your company’s brand awareness and lead generation since they are usually seen by a larger, more targeted audience. These ads can be set up by the company page administrator using LinkedIn’s Campaign Manager or you also have the option to sponsor an existing post. These ads can run for up to 30 minutes, which is much longer than the native video content mentioned above. Whether you are sharing the video on your desktop or phone, sharing LinkedIn native videos is basically a three-step process. When doing this on your phone, you can record and post in-app and add text, while doing this on desktop requires a pre-recorded video. 1. From the homepage, click Share an article, photo, video, or idea. 2. Click the video icon. 3. Upload the video you want to share. 1. Look for the share box (iOS) or post button (Android) at the top of the feed. 2. Tap the video icon. 3. Record a video in the app, or upload something you re-recorded. 4. Tap the filters or text button. 5. Add filters and/or text. Easy enough, right? Once you have posted the video, then you will have access to audience insights, which includes the number of views, likes, and comments that your post is receiving. You’ll also be able to see the top companies, titles, and locations of viewers. This obviously comes in very handy, as you will be able to see the types of videos that drive the most traffic. Once armed with this kind of information you can begin to tailor your content to what works best for your company moving forward. 1. Log in to Campaign Manager to create your campaign. 4. Choose your main objective. Options include: get website visits, collect leads, or get video views. 5. Select video as your ad type format and click Next. 6. Click Create new video. 7. Fill out the form, upload your video, and hit Save. 8. After your video has uploaded, select the video by clicking the checkbox next to it and then hit Next. 9. Choose your target audience criteria and click Next. 10. Set up your bid, budget, the duration for your campaign, and click Launch Campaign. What are the LinkedIn Video Specs? When it comes to posting these videos, it’s pertinent that you keep these specs in mind. 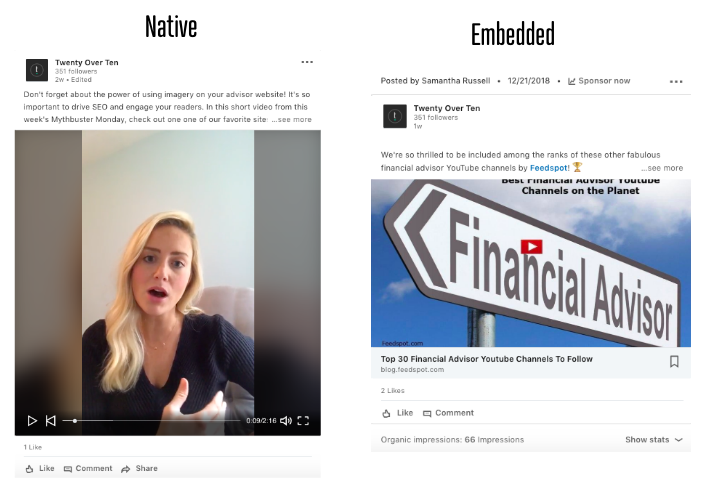 These specifications vary between standard native videos and LinkedIn video ads, so make sure to take note of the differences. File formats: ASF, AVI, FLV, MPEG-1, MPEG-4, MKV, QuickTime, WebM, H264/AVC, MP4, VP8, VP9, WMV2, and WMV3. Formats that are not supported include ProRes, MPEG-2, Raw Video, VP6, WMV1as. Orientation: Only horizontal. Vertical videos are not supported by LinkedIn video ads. Frame rate: Maximum of 30 frames per second. So, now that you know the specs to use and the types…what are the best practices? Here are 🔟 top ideas to help you to excel on LinkedIn video! Don’t get too excited before you start without making sure you have the ideal setup. Yes, anyone can technically be a “cameraman” these days with the use of mobile devices, but that doesn’t mean everyone is good at it. If you just remember the simple tricks below, then your video will turn out much better! Lighting: Choose a well-lit area.💡 Natural light is usually your best bet, but artificial light can work, as well. Also, beware of backlighting so that your subjects don’t come out too dark. Camera position: Take a test video, and adjust your camera setup, as necessary. Camera: If recording from your phone, use the rear camera, and be sure that you keep it steady. Background: Avoid a cluttered or distracting background. Body language: This is easier said than done, as many people freeze up in front of the camera, but try to maintain a relaxed presence by rehearsing your script. Look directly at the camera, smile, and speak as in natural conversation. 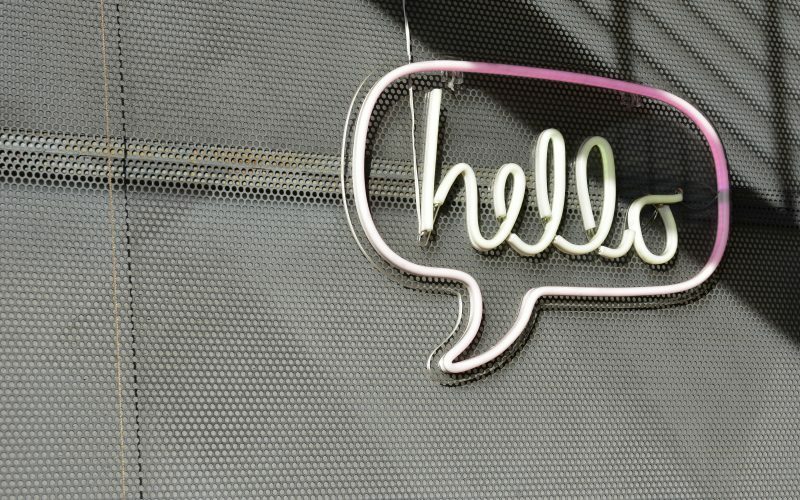 As we have mentioned in so many of other posts about email marketing or creating a strong website, it’s important to reel your viewer in from the start. We recommend doing this in the first 1-2 seconds of the video, as they often aren’t very long. Generally, if you can’t draw someone in within the first ten seconds, then attention drops off after around the 10-second mark. That’s not very long to have to draw someone in, which is why you need to wow them from the start! You need to share your message right off the bat, otherwise, your viewers will drop off. If you can knock it out of the park at the start of the video, then this very likely increase your lead generation. Think about playing a video at work, are you going to use it with sound? Probably not! In fact, up to 85% of social media videos are played without any sound. Because of this, you need to be sure that you are including descriptive images, infographics 📈, use expressive body language and even add captions to your videos in post-production. Click the video icon in the share box on desktop and choose the video you want to share. When the preview shows up, click the edit icon on the top right to see the video settings and then click “select file” to attach the associated SubRip Subtitle file. Are you trying to watch one single shot for the whole video? Definitely not, as this can get very boring 😴. Viewers start to drop off if not immediately engaged, so including different angles is a great way to vary it up a bit. Also, b-roll is a very useful tool when it comes to adding in images or infographics. This will give the viewers something more riveting to view especially during the voiceover sections. It has been suggested that LinkedIn video is kept between 30 seconds and 5 minutes, but the most successful video ads are less than 15 seconds long. This is just a suggestion though and length can vary depending on how you to want to use the video. For strong brand awareness and consideration, LinkedIn suggests keeping it under 30 seconds. Be sure that you do not exceed 10 minutes, as this is as long as a video for this platform can run. As we mentioned above about including closed captions and creating the video as if the sound is off, so don’t miss this opportunity to describe your video and convey a message. Keep it short and sweet though! We recommend keeping your captions to 50-100 characters. Like in Twitter, LinkedIn hashtags and @ mentioning relevant companies or members in your caption as a great way to increase reach and exposure. Lastly, don’t forget to include a link. 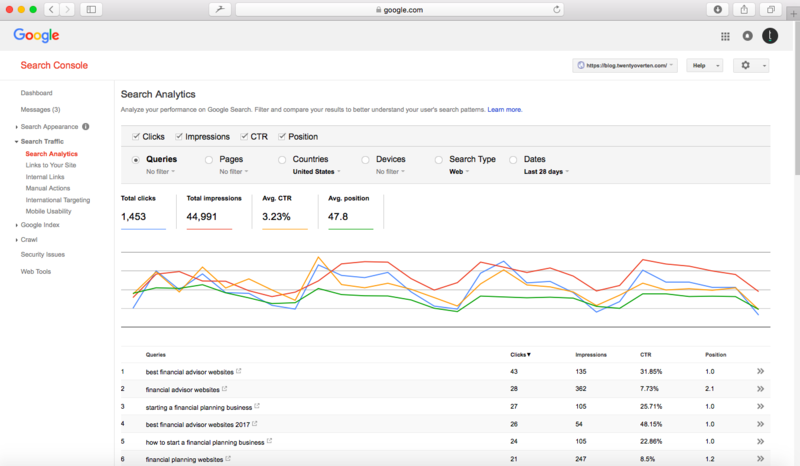 If the point is to drive people to your website to check out services and products, then this is very important. We have talked about the importance of keywords before, so be sure to use the word “video.” You have taken the time to create this video, so now promote it! Generally, most branded video content on LinkedIn can be grouped into 4️⃣ main categories: culture, products and services, news, and events. You can also analyze blog content and see the best way to go about cross-promoting your work on social media to drive even more traffic to your advisor site. Show your viewers that big things are in the works at your company! Give them something to look forward to. If they have enjoyed using something from your firm in the past, then they will probably be looking forward to new things happening. Visitors want to see the people that make things happen. This is the time to humanize your brand and show-off the great people that make your company run so smoothly. When people come to your website, they are often looking for an answer to something. A video that offers up explanations or simplifies things, such as confusing financial jargon is very helpful. In an industry that can be difficult for viewers to understand, a video is a great way to quickly and effectively teach something. 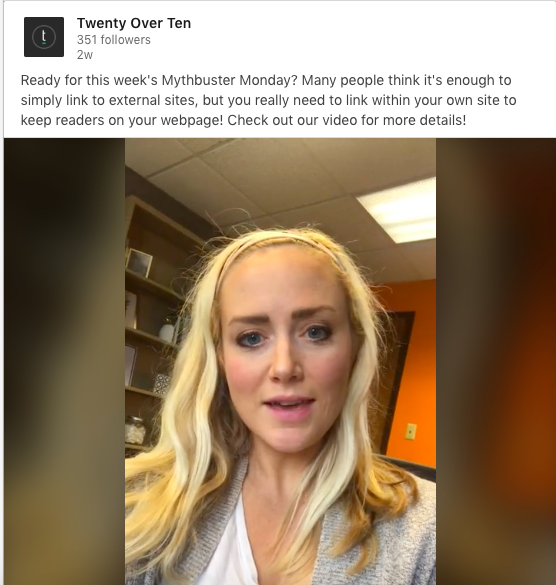 In the Mythbusters Monday video below, we are discussing the importance of internal linking within your website so that our readers can learn something new when they visit our LinkedIn page. Do you have an important event coming up in the future…maybe an important conference in your industry? A great way to increase enrollment is to show viewers what they can learn if they attend the conference, and a quick video is the perfect way to do this! Did you attend an awesome conference and you want to share it with others who may be interested but didn’t get to go? Providing a recap video or some type of coverage that touched on the 🔥 topics is a great way to do this! 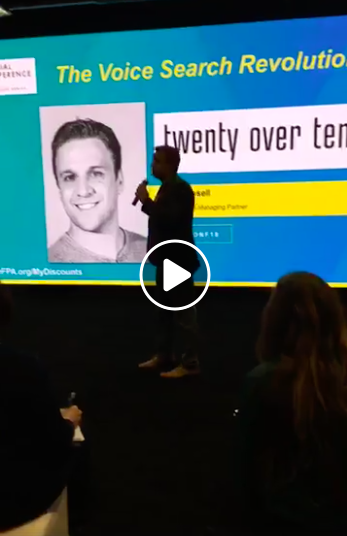 Twenty Over Ten attended the 2018 FPA Annual Conference this fall, where we had the opportunity to network with other financial advisors in the industry to discuss digital and niche marketing. In the below video, we included a quick recap on “voice search” so that others who may have questions can get information on the topic. 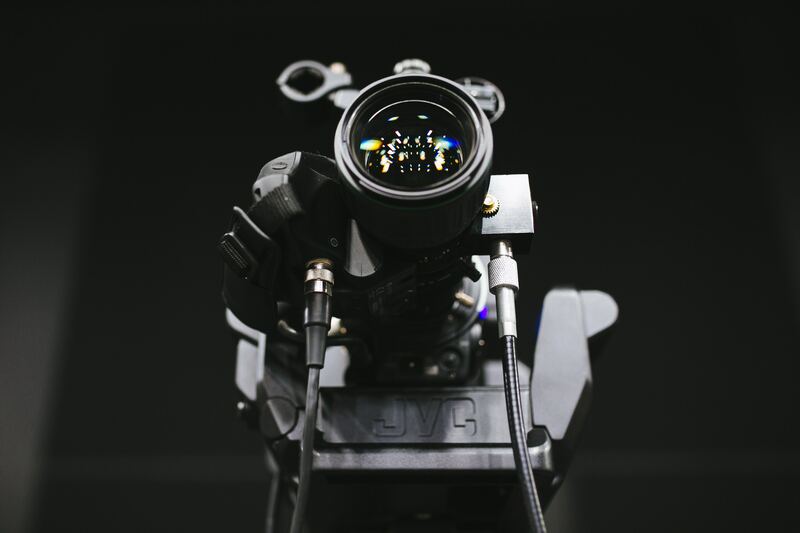 Doing a quick “get to know” your video of the executive team is a great way to “humanize” your brand, as we have mentioned earlier in this post, as well as, allow members of the team who may not always do the day-to-day activities get a chance to speak to viewers through video. Want to find out more about the people who will be working with you on a daily basis? Showcasing your employees shows that you care about what they do inside and outside of work. If they received any accolades, did some volunteer activities or anything that might make them stand out, then this is a great time to talk about it. If you want to show how you are making a difference, then have clients discuss how great it was to work with your employees and company. Be sure to get approval from clients, and then you could piece together a quick video with clients saying something about your firm. It’s simple and provides a way to “back up” what your company is doing for others. It’s okay to brag! It’s great to give back to the community, and as a company, it’s also fairly expected to not only do your job but give back socially. If your company volunteered at a food bank, then this is a great time to include a quick clip with pictures and b-roll footage. What does your company stand for? Do you have a certain niche that you specialize in? Use LinkedIn video to stand out and show the type of work that you do. It can help explain any questions that viewers may have and give a better explanation of what exactly your company does. Not only can we help you create a 💣 website, but we can help with your social media needs! In addition to this, we have automatic site archiving, unlimited blogging, and site archiving for compliance.